When our children were small, I started on an elaborate plan each year before Thanksgiving, roughing out our celebration for each night of Hanukkah. Some nights would involve giving to others instead of receiving presents, some nights we gave the children tiny token gifts, or practical gifts such as clothing. Some nights we would skip gifts if we were celebrating with friends: it seemed like enough to just enjoy sharing the light of the candles and feasting on latkes. My strategy as the Jewish parent in an interfaith family has always been that Christmas presents remove some of the pressure to give Hanukkah presents, providing an opportunity to stress the non-material aspects of Hanukkah. I now have two stylish and independent teenagers, and it’s not easy to pick out gifts for them at this point, anyway. The task is made harder by the fact that I have a real grudge against gift cards, the default gift for teens, though of course my kids love getting them. They earn their own spending money: my daughter babysits and helps teach in the interfaith Sunday School kindergarten class, my son busks on the street with his friends, playing guitar, bass and ukulele. Giving them cash gifts or gift cards seems to me to devalue the money they earn for themselves through creative and educational work, and interfere with their budding little work ethics. So this year, I was planning to shift even further into a “post-gift” phase of Hanukkah. And then wonder of wonders, miracle of miracles, the perfect teen Hanukkah celebration arrived in the form of Matisyahu’s Festival of Light tour. Matisyahu is the hippest Orthodox Jew on the planet. The artist formerly known as Matthew Paul Miller grew up as a Reconstructionist Jew in suburban White Plains, where he followed the jam band Phish and revered Bob Marley. While spending a semester in Israel, he experienced a spiritual transformation, became a Chasid known as Matisyahu, and moved to Crown Heights. Melding mystical lyrics inspired by Judaism with old-school reggae and contemporary beatboxing, Matisyahu became an indie-music darling. As a passionate Bob Marley fan (I saw him three times in the 70s), I have to say that Matisyahu is that rare musician who can pull off a Bob Marley cover without making me squirm. More importantly, and strangely, his Kabbalistic musings and ethereal tenor voice seem to appeal across religious boundaries. My Episcopalian niece and nephew both adopted Matisyahu early on, as savvy high school and college students. Last year, my son explored Matisyahu’s lyrics when he delivered a report on the Chasidim for his interfaith coming-of-age class. Lately, he’s been perfecting a cover of the musician’s uplifting and contagious song, “One Day.” When we have moments of adolescent and maternal conflict, my son crawls out his bedroom window onto our porch roof and sings this song to the night. I’m hoping he might perform it at his Bar Mitzvah in the spring. But back to Hanukkah. 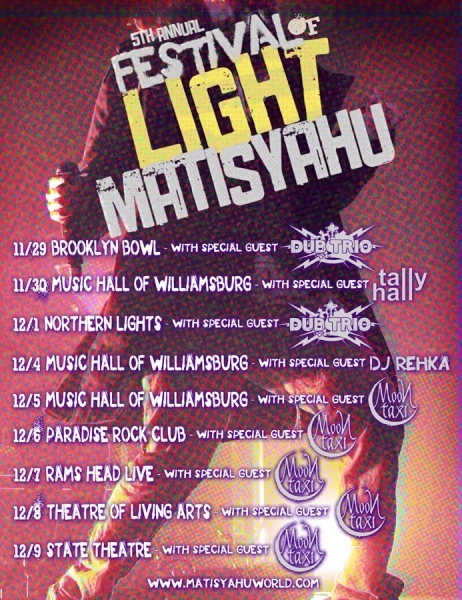 Every year for the past four years, Matisyahu has delivered an eight-night “Festival of Light” concert stand in NYC around Hanukkah. This year, for the first time, he’s taking the Festival of Light on tour for the final three nights, with a stop in Baltimore, a city rich in Jewish history, and a city that just happens to be the birthplace of my daughter. So on the sixth night of Hanukkah, you know where to find us. I may be trying to downplay Hanukkah gifts, but have to give in to the gift of great music. What a nice post! I was just talking with another friend about her search for just the right Hanukkah gift for her girls, the search for meaning and balance, that is. I think you hit the jackpot, the gift of music is forever and always with us. What a neat gift for your teenagers! I’ll make a note of this idea for the future and in the meantime borrow another idea I read on your blog last year: there’ll be one night of Hanukkah this year on which the kids will make a donation to protect a particular habitat and then will get a tiny toy animal from that habitat to better make the connection (it’ll be their first time doing this; I’m intending to skip the token gift next year.) 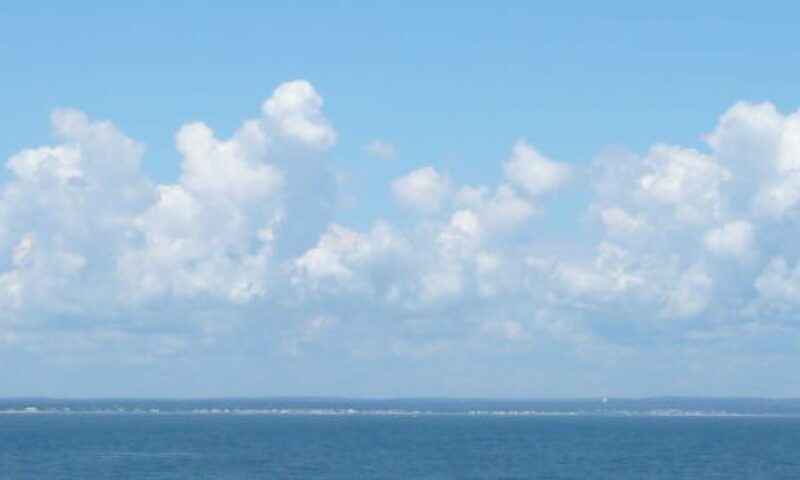 Your blog is full of good ideas; I love reading it!